New from East Malling. 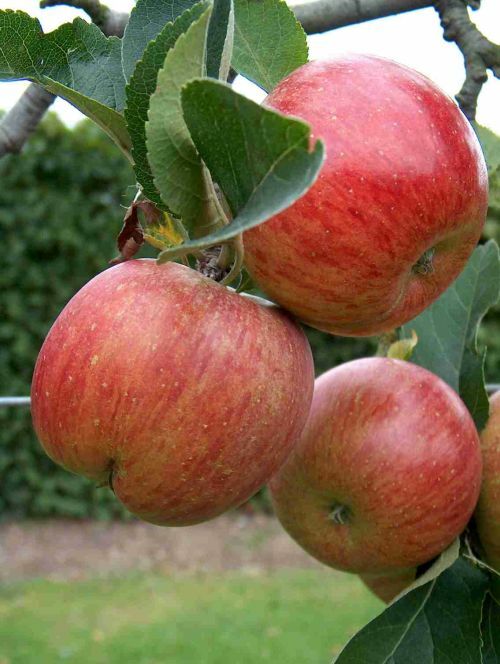 Truly outstanding for its high levels of disease resistance, Saturn is resistant to scab and mildew and always seems to be such a clean and healthy looking tree. It has been specifically recommended for the organic grower and will no doubt be of great interest to anyone who would rather garden with as little chemical intervention as possible. Apart from its disease resistance, Saturn is an excellent all round variety. The very evenly shaped, rather conical fruits are brightly blushed red on a green yellow background and have good sweet flavour. The flesh is very crisp with a high juice content - very satisfying to eat. The fruits can be picked in early October and will store well until January. Saturn is a heavy cropper with fruits of a large size and has performed well in climates both warm and cold. It forms a tree of average vigour which spurs and flowers freely. It is easily pollinated and will excel as all growing systems including the columnar type tree or bush etc. For a variety to be recommended by a commercial breeding Station for the Amateur Gardener is unusual; for it also to combine so many desirable attributes even more so. Saturn is without doubt a very important new variety and we are very proud to he the first to introduce it. Highly recommended. A valuable addition to the limited list of varieties which can be grown on their own. SATURN IS SELF FERTILE. All trees £1.00 extra.